The mechanisms behind the energy release in a solar flare, and its transport to the lower atmosphere, are still widely debated. In our current understanding — the standard flare model — magnetic energy stored in the corona is released via reconnection in the form of a beam of accelerated electrons . The electrons directed downward along magnetic loops travel through an atmosphere of increasing density and are ultimately stopped by Coulomb collisions deep in the chromosphere, leading to heating and the emission of radiation across the spectrum. Spectroscopy of the flaring chromosphere allows us to probe its characteristics, and test the models. The flare SOL2007-06-05 (C6.6) was caught by a Hinode/EIS raster with excellent wavelength/temperature coverage. The observations used were rather unusual ‘sparse rasters’ from EIS, where a region is sampled rapidly by moving the 1″ spectrometer slit in 10″ jumps, meaning that a large region is scanned in 150s, but at a poor spatial resolution. The data are used to derive intensities, velocity shifts and electron densities at several times during the flare. Fig. 1 is a selection of rasters in Fe XII, showing the evolution of the footpoints before and after the flare peak (fourth column). Early brightenings (top row) on either side of a dark filament evolve into flare ribbons. Figure 1: Fitted rasters for Fe XII. The top and second row show the intensities in each of the lines used in forming the diagnostic, with the upper one being produced by excitation from the density sensitive level. Velocity maps are produced using the 195.120 Å line and overlaid with density contours at log ne = 10.2. The fourth column corresponds to the observed peak. The bottom row of Fig. 1 shows the density maps obtained using the Fe XII diagnostic pair. The regions of increased density correspond well to the flare footpoints. The less density-sensitive line in the diagnostic pair (second row) shows very little change, suggesting that the temperature remains fairly stable. We have used RHESSI imaging and TRACE to confirm these are the locations of flare footpoints. 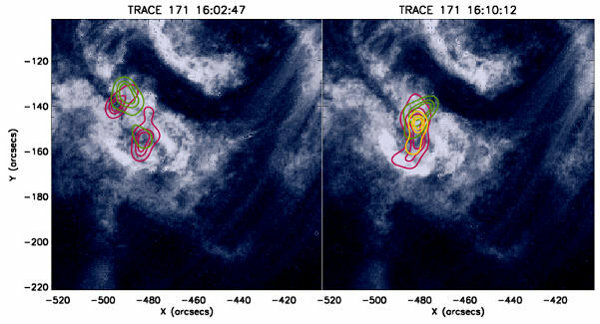 In Fig 2 we see the RHESSI HXR contours lie over the same ribbons seen in TRACE 171 Å at around 1 MK. Figure 2: Impulsive phase TRACE 171 Å images with RHESSI 60%, 80% and 90% intensity contours overplotted in 6-12, 12-18 and 18-25 keV energies (magenta, green and yellow respectively). So we find electron densities in footpoint regions rising during the impulsive phase to almost 1011 cm−3 at around 1.5 MK. These are chromospheric densities but at temperatures corresponding to the corona. What is the source of the high density, hot material? The most obvious explanation is that we are seeing material deep in the chromosphere being heated to coronal temperatures. The density diagnostic can only be used in a small range of temperatures around the peak temperature, Tmax at which the lines form. As the flare heats ever deeper layers of the atmosphere to Tmax, the electron density at a given temperature increases. 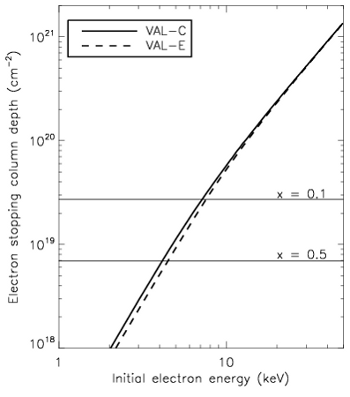 Figure 3: Stopping column depth as a function of injected electron energy, for the VAL-C and VAL-E model atmospheres, and for model atmospheres with the hydrogen density structure of VAL-C and VAL-E but assuming full ionisation throughout. Is this all that is happening? The chromosphere after all is not completely ionised; is some of the enhanced electron density the result of freeing more electrons via the ionisation of a partially neutral atmosphere? Using the available RHESSI spectra for this event we can estimate the energy of the electrons impacting the chromosphere. At around 16 keV, and using the VAL-C and E model atmospheres (Fig 3), we find that such electrons can easily penetrate deep into the partially ionised chromosphere. Through collisions, they would increase the ionisation fraction leading to a higher local electron density. Using high cadence rasters from Hinode/EIS and accompanying instruments, we have shown that flare footpoints display electron densities up to 1011 cm−3 and temperatures exceeding 1 MK (also seen in ). To fully explain these enhancements, and perhaps untangle the contribution from ionisation, will require the use of more sophisticated models (e.g. ). A differential emission measure (DEM) calculation is also possible from our data set. A more complete analysis of this flare can be found in , including discussion of evaporative velocities, and the observation that the most significant density increases and velocity flows have no associated HXR emission. 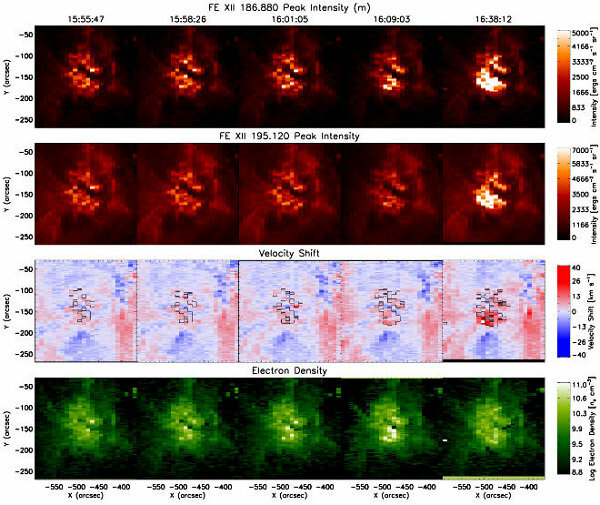 The use of an imaging spectrometer like EIS is incredibly useful for flare observations, and now with unprecedented images from SDO/AIA and high cadence spectra from SDO/EVE we are in a great position to learn more about these events.